Cameroon Two Horned Chameleons are an amazingly beautiful chameleons we offer for sale. From the wide array of colors, to the sail fin back and the two horns on the face. Montium Chameleons are a montane species of chameleon and prefer cooler temperatures and plenty of water. The care of a Jackson’s Chameleon is the best way to describe their care. 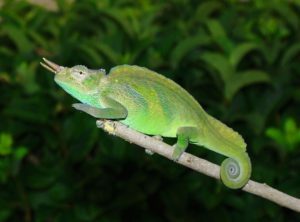 We have a couple of pairs of WC Cherry Picked Cameroon Two-horned Chameleons for sale. These are very unique chameleons with their velvet like skin, 2 horns and the sailfin on their tail.